The institute has dedicated itself for the cause of UPSC/TNPSC aspirants community. To make your preparation, smarter, we are coming with this book on MODERN INDIA. History is an integral part of all Competitive Examinations and especially so, in the UPSC Examinations. In the Civil Service Preliminary Examinations about 20% of weightage is given to History and similarly in the Mains–Paper I about 70% weightage is given to History Questions. Because of this History has become an inevitable subject in the UPSC Preparations. Study of history and understanding one’s society is inextricably linked. So it is said that history without knowledge of society is fruitless and study of society without the knowledge of History is rootless. 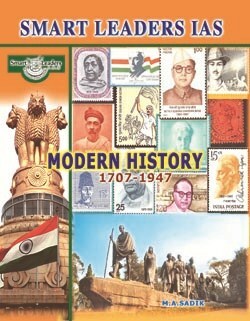 This material consists of the Basics of the Modern Indian History starting from 1707 – 1947. This is a must read for an aspirant preparing for UPSC preliminary and mains examinations. We have given the content in an comprehensive form, so that you can know the facts as well as the context of it. Only preparation period is a not a period of exhaustion but an enjoyment. So cherish and relish your preparation. Don’t guide each day by the harvest you reap but by the seeds that you sow. The best and most beautiful things in the world cannot be seen or even touched – they must be felt with heart. Knowledge is the best and the most beautiful thing in the world. A man is but product of his thoughts. What he thinks, he becomes. So think, act and become what you desire to become. Contact No. 044-43525468, 7200010122, 9176787980.